Hacker Noon : How hackers start their afternoons. High Scalability : Success stories of various companies on their apps, infra scaling. The DEV Community : Where programmers share ideas and help each other grow. MIT Technology Review : MIT's tech review magazine. Nautilus : NewYorker for tech. LWN : Weekly news coverage of opensource technologies, programming, etc. ( Originally Linux Weekly News). CodeAbbey - a place where everyone can master programming : Best place to begin with problems that start at the easiest and gradually increase difficulty with each problem. Reddit.com/r/dailyprogrammer : interesting programming challenges where you can learn from looking at other's code , even if you are not able to solve code you can look at how others solved. People Can Program : The most user-friendly code learning application on the internet. treehouse : The fast, easy, and affordable way to build your skills. freeCodeCamp | React project ideas : 27 fun app ideas you can build while learning React. 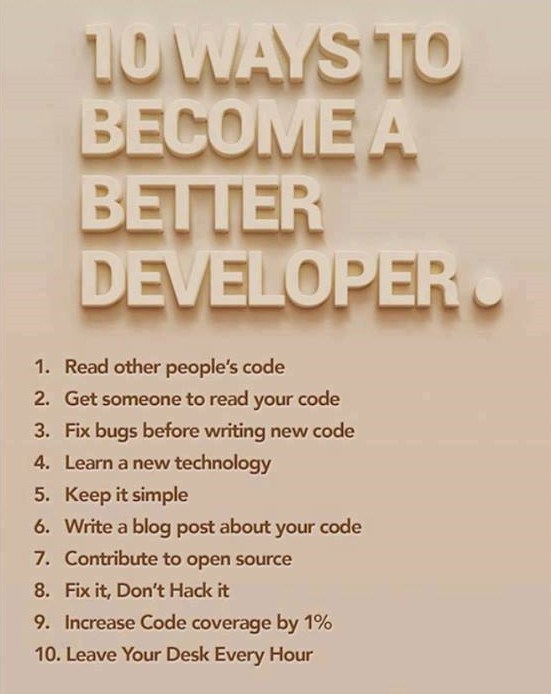 10-ways-to-be-a-better-developer : Ways to become a better dev! CodePad : Quickly Conduct Coding Interviews and Phone Screen Interviews. /r/cscareerquestions : Here's a pretty big list of programming interview questions I compiled while studying for big 4 interviews. I think you guys will find it useful! Code Project : For those who code! samwincott/Internship-Guide : An aggregrate of links related to internships. Download: The True Story of the Internet : Play-list of discovery channel documentary on browser wars, dot com bubble and more. Part 1 is unavailable for free streaming due to widespread copyright claims. Coursera.org : Take the world's best courses, online. edX : Free Online Courses, Advance Your Career, Improve Your Life. Deep Dive Java : Garbage Collection is Good! IntelliJ Keyboard Shortcuts : Keyboard shortcuts to enhance your productivity when working in IntelliJ. The Java™ Tutorials : The best tutorials for Java. fast.ai : Free practical deep learning course for coders without grad-level maths! Advice on Research and Writing : A collection of advice about how to do research and how to communicate effectively (primarily for computer scientists). reddit.com/user/ashish2199/m/cs_student_subs : a multisubreddit of all subreddits of topics related to computer science and programming. Gynvael Coldwin : Awesome reverse engineering and hacking(CTF) videocasts. Every wednesday are new live streams. O'Reilly : interviews and talks of world's best technical writers. Data structure and Algoritms : List of some algoritms and datastructure with their solutions. Coding Blocks : A podcast covering topics such as best programming practices, design patterns, coding for performance, object oriented coding, database design and implementation, tips, tricks and a whole lot of other things. Developer On Fire : A podcast that shares the humanity of developers and tells stories of some of the amazing people in software, hosted by Dave Rael. Groovy Podcast : A podcast dedicated to the Groovy programming language and its ecosystem. IPhreaks : A weekly group discussion about iOS development and related technology by development veterans. We discuss Apple, tools, practices, and code. MS Dev Show : Jason Young and Carl Schweitzer talk about the latest in developer news covering topics such as the Azure cloud, Windows, Windows Phone, Visual Studio, and cross-platform development using the Microsoft platform. Software Engineering Daily : A daily technical interview about software topics. Syntax : A Tasty Treats Podcast for Web Developers by Wes Bos & Scott Tolinski. The Cynical Developer : A podcast that aims to help you to improve your development knowledge and career, through explaining the latest and greatest in development technology and providing you with what you need to succeed as a developer. Covering Desktop, web and mobile development, mainly around the .Net Stack but often looking into other software and frameworks. Dynamic programming - PrismoSkills : very good resource if want to learn how to solve DP problems. Open Data Structures : Excellent resource for learning about DS and algos, provides code in various languages C++, Java and pseudocode. VimTutor+ : Learn VIM from the browser. LiveEdu.tv : screencast of people building application, websites, games, etc. Twitch.tv : The programming community of twitch. Art of Problem Solving : Is math class too easy for you? You've come to the right place! HackerRank : Practice coding. Compete. Find jobs. GitBook : GitBook helps your team write, collaborate and publish content online. Codesandbox.io : CodeSandbox makes it easier to create, share and reuse React projects with others. Godbolt.org : Excellent tool for exploring the assembly output of different compilers with and without optimization. Github Gist : Instantly share code, notes, and snippets. Antonio081014's Algorithms Codes : The world is under the RULE. Clean Coder Blog : blog of author of book "Clean Code"
stevehanov.ca : I know how to make and sell software online, and I can share my tips with you. Ridddle : A youtube channel about science, mainly, but not only, the universe and space. Open Hatch : OpenHatch is a non-profit dedicated to matching prospective free software contributors with communities, tools, and education. Source Forge : SourceForge hosts nearly 280,000 projects (at last count). It serves more than 2 million downloads a day and includes apps and tools in a wide variety of categories. Google Code : Google offers free hosting for open source projects using the Subversion or Mercurial version control systems. It offers 2 GB of storage, integrated code review tools, a wiki, and an issue tracker. The Google Code site also provides links to Google's many publicly available APIs and other developer tools. Launch Pad : Maintained by Canonical, LaunchPad is particularly targeted at projects that run on Ubuntu. It provides hosting for more than 21,000 projects that use the Bazaar version control system. Google Summer of Code : Google Summer of Code is a global program focused on bringing more student developers into open source software development. Students work with an open source organization on a 3 month programming project during their break from school. Open Source Web Design : Open Source Web Design is a platform for sharing standards-compliant free web design templates. We give web publishers a voice through good design. Mozilla Winter of Security : The Winter of Security (MWOS) is a program organized by Mozilla's Security teams to involve students with Security projects. Students who have to perform a semester project as part of their university curriculum can apply to one of the MWOS project. Eclipse Lab : Eclipse Labs is a community of open source projects that build technology based on the Eclipse platform. It provides the infrastructure services typically required by open source projects, such as code repositories, bug tracking, project web sites/wiki. Eclipse Labs is hosted by Google Code Project Hosting, so it will be very familiar to developers already using Google Code Project Hosting. Bit Bucket : Like GitHub, BitBucket hosts both public and private projects. On this site, open source projects and private projects with fewer than five users are free. It hosts more than 48,000 repositories, many of which are searchable on the site. Media Wiki : MediaWiki is a free software open source wiki package written in PHP, originally for use on Wikipedia. It is now also used by several other projects of the non-profit Wikimedia Foundation and by many other wikis, including this website, the home of MediaWiki. Code Curiosity : CodeCuriosity is a platform that encourages contributions to open source. Everyone is rewarded for their efforts, no matter how big or small they are. Code Triage : Help out your favorite open source projects and become a better developer while doing it. Up for Grabs : This is a list of projects which have curated tasks specifically for new contributors. These are a great way to get started with a project, or to help share the load of working on open source projects. First Timers Only : Contributing to open source for the first time can be scary and a little overwhelming. Perhaps you’re a Code Newbie or maybe you’ve been coding for a while but haven’t found a project you felt comfortable contributing to. Your First PR : Your First PR helps you get started contributing to Open Source by showcasing great starter issues on GitHub and elsewhere. Please consider a github star if you find this useful and/or consider making a contribution.